Photograph of the ancient railing around the Mahabodhi Temple, Bodh Gaya, from the Archaeological Survey of India Collections, taken by Henry Baily Wade Garrick in 1880-81. The Mahabodi Temple complex is one of the holy sites related to the life of Buddha as it is the place where he attained Enlightenment. The original shrine is believed to have been raised by Emperor Ashoka in the 3rd century BC and the present temple dates from the 7th Century, late Gupta period. The temple was built in front of the Bodhi Tree, under which the Buddha obtained enlightenment, surrounded by a quadrangular stone railing. The older sandstone posts date about 150 BC of the Shunga period and have carved panels and medallions with animals and lotus design as well as yakshis, amorous couples, winged horses and centaurs. 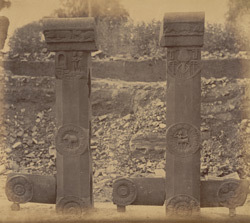 The railing was extended several times and the posts from the late Gupta period (7th Century) of coarse granite are characterised by an elaborate foliate ornament and miniature figures and stupas. Repairs and restoration of the temple were undertaken by J.D. Beglar, an appointment authorised by Sir Ashley Eden, Lieutenant-Governor of Bengal, in 1880. Cunningham states, "Mr Garrick next visited Buddha Gaya for the purpose of seeing the work in progress, and of photographing the sculptures and inscriptions which had been exhumed, as well as various scenes on the pillars of the old Buddhist railing." Alexander Cunningham and H.B.W. Garrick, Report of tours in North and South Bihar, in 1880-81 (A.S.I. vol. XVI, Calcutta, 1883).